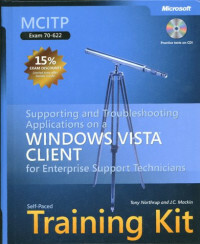 Announcing an all-new MCITP Self-Paced Training Kit designed to help maximize your performance on 70-622, the required exam for the new Microsoft Certified IT Professional (MCITP): Windows Vista Client Enterprise Support Technician certification. This 2-in-1 kit includes the official Microsoft study guide, plus practice tests on CD to help you assess your skills. Tony Northrup, MCTS, MCSE, CISSP, and Microsoft MVP, is a networking consultant and author. He is coauthor of several Self-Paced Training Kits, including those for Exams 70-270, 70-271, and 70-272, among several other certification exam prep titles. J.C. Mackin, MCSA, MCSE, MCT, is a consultant, writer, and trainer with more than a decade of experience working with networks. He's coauthored several books, training courses, seminars, and articles. He also contributed to the MCTS Self-Paced Training Kits for Exams 70-431 and 70-443. THROUGHOUT THE HISTORY of software engineering, the methodology used to write computer programs has undergone several paradigm shifts, each building on the foundation of the former by increasing code organization and decreasing complexity. This book takes you through these same paradigm shifts.